Small and lightweight, so are easy to carry and distribute. Provide great advertising opportunities when printed with your name and logo. Rewritable, so recipients can use them personally, extending your advertising potential. Available in multiple memory size options for individual needs. 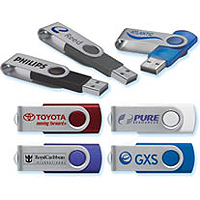 You can distribute custom USB drives preloaded with information at your next trade show, conference, or event, and Total Media, Inc, can help you do so! Call or e-mail for more information!